Leadership development and team building are two integral components of what The Ranch instills in the youth that attend our summer and year-round weekend sessions. One way that we teach team building and communication skills is through a high ropes course exercise during one of the daily rotation slots. This week, I had the privilege of witnessing the impact that the team building ropes exercise has on the vulnerable youth that we serve. It was a sunny Wednesday morning and several of our Ranchers (ages 8-12) were getting prepared to go up on the high ropes course, many of them for the first time. Jerry, one of our skilled leaders, was giving them careful safety instructions and making sure they were fastened in securely. Although some of the students are visibly nervous they all want to accomplish the feat of having done the high ropes course. One student anxiously said “what if it snaps?” (referring to the harness). Jerry replied “It won’t snap, because God’s got your back!” That’s all it took for the young lad to be ready to complete the challenge. Climbing up the ladder, a young boy named Sam looked visibly nervous. All of the students had already crossed the suspended obstacle course and he wanted to do it as well but couldn’t quite seem to muster up the courage. His leader encouraged him to take the first couple of steps. He shakily stepped out onto the “bridge” and then froze. That’s when something super special happened…one boy on the other side shouted “You can do it, c’mon Sam!” Another chimed in, “Sam, Sam, Sam!” It was then a ripple effect. Eventually the entire group on the other side was cheering Sam on with so much enthusiasm that Sam couldn’t help but smile, he tentatively took one step and then another until he finally made it to the other side where everyone hugged and congratulated him. You could tell their reactions and support had completely made scared little Sam’s day. 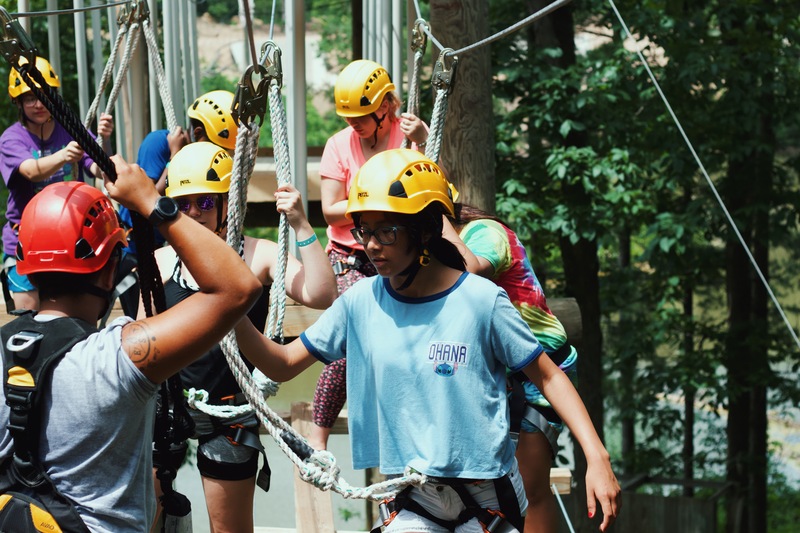 The next part of the team building challenge is for everyone to hook on to one another’s harnesses to come back across the swinging bridge together. In order to do this part of the mission everyone must communicate and rely on each other in order to not “fall” off the suspended bridge. (Note: everyone is harnessed so should they take the wrong step the harness would hold them). Sam was one of the first ones to get things rolling on the trip back across. Sam was listening to instructions and helping his buddies across. Sam was communicating. Sam was leading. All of this happened because a leader helped Sam take his first steps and his teammates supported him to continue. Sam was then able to turn around and demonstrate what he learned going across alone to help the team succeed when it came to doing it together. This story is an illustration of what the mission of The Ranch is all about. We pour into our leaders so that they can pour into our youth and then our youth grow and develop and one day lead the next generation-in the classroom, in a career, in a community and in a family. Thank you for helping us mold and shape the lives of leaders to impact your communities for the better. The Ranch Goal: Break Cycles. Build Leaders. Transform Communities.